Well, as I sit here this first morning of December, it is SNOWING! I LOVE IT! I know a lot of you will think I’m crazy but I don’t care, I LOVE IT! And besides, it is December 1st and we are due for some snow it help get us in the mood for the Holiday season. Don’t you agree? It’s that time to get out all your Christmas lights, ornaments and home décor and get into the spirit of Christmas. I love it! My favorite part of the holidays ;-) Merry Christmas! Yep - got that in my house too. Great shot!!!!!!!!!!!!!!!! Great capture of the colored lights. Have fun getting them straight! 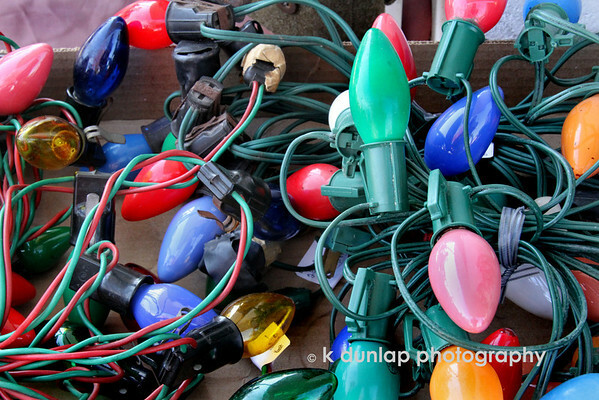 Nice shot; I hate untangling the Christmas lights. I do love Christmas, though! Twisted, tangled, all wrapped up! Fun and collorful capture associated with the Christmas season!